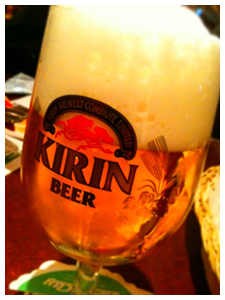 According to a waitress in Kirin City, beer helps your stomach work well, and contains vitamine and mineral. However, the greatest thing that beer brings us is that it helps to release stress. Think about your life..if you have something bad in your life, do you want to drink beer? Don't you think beer fits to an atmosphere with your friends to communicate? Kirin City is one of my favorite place to drink beer. There are 5 kinds of draft beers; Kirin Breau Miester, Kirin Lager, Stout, Half and Half, and Heartland. Thus you can enjoy many different beers in one restaulants. Moreover, there are bottled beer, Guiness, many types of wines and cocktails. Even if you want to drink with a person who cannot drink beer, you can bring her or him to the place. Staffs making beer there have to have lisence to make beer. It seems kind of easy, but it is not actually. The taste is different by the staffs. They have to practice a lot before they take the exam, and of course sometimes they cannot pass. Moreover, they have to have knowledge about beer. In short, staffs in the restaulants are all professionals of beer. Why don't you start planning to see friends with fabrous beer? xD xD XD I love beer too!!! Its so easy to drink and you don't really feel the alcohol...Very awesome picture! I love how the precipitation on the glass is really easy to see :) We definitely should go to kirin city!! Great post! I love beer too! specially japanese beer it tastes so good! yes, I know you love beer, too!!! there is kirin city near school, so we definitely should go!!! one of my friends who love black beer said the stout at that place is the best black beer ever! I don't know the taste of beer in other countries...are they really different from Japanese beer?